One of the things that got me going on the Super Frug bandwagon was trying to figure out how to spend less on beauty products. Here’s the breakdown per month. $35 on face moisturizer. $5 on face cleanser. $7 on body lotion. $15 on shampoo and conditioner. $4 on olive oil soap. Total: $66 a month = $792 a year! I could have used $792 to take a nice vacation or take creative writing courses or sign up for a year’s worth of yoga classes. Holy crap! It made me mad just thinking about it. I was getting totally jacked by the beauty industry. I said, no more. I was a woman on a mission. I was going to find a way to decrease my dependence on beauty products and still look and feel good. Here’s what I did. I found a technique called the oil cleansing method. Basically, you massage oil into your face to get out the dirt and impurities. Then you hold a warm, damp washcloth over your face to steam it. Then wipe off all the oil. Keep rinsing the washcloth and wiping off the oil until your face is clean. NOTE: Buy yourself 7-10 cheap washcloths (you know those ones you can buy in a bundle from Fred Meyer or Target) so you can use one a day. Don’t reuse a used washcloth that has old oil on it. 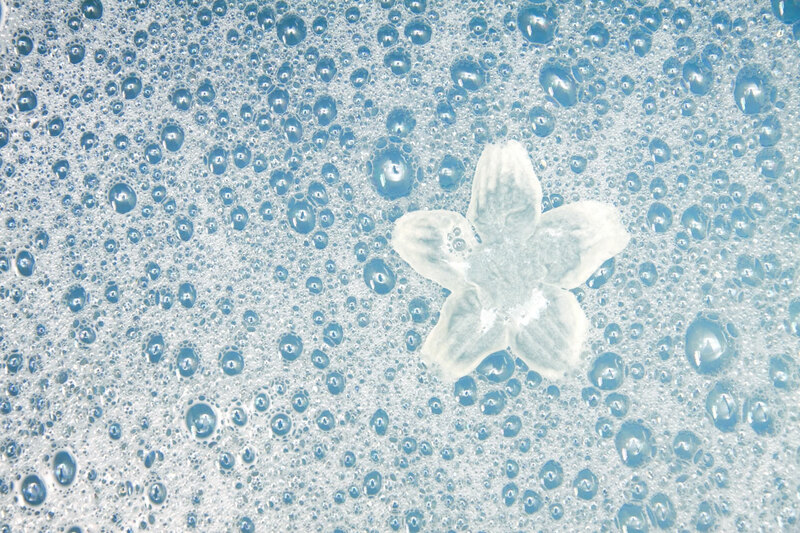 Also, wash your washcloths on HOT in the washing machine and add 1/2 cup of Borax to deep clean. After your shower, if your face is a little dry, place 5-10 drops of oil between wet palms, rub your hands together vigorously and then pat and lightly massage your face with the oil-water combo. Use a tissue to dab areas that get too oily. There are lots of different oils to try. I started with organic sunflower oil but it started to make my skin pink and itchy after 1 1/2 years. So I switched to using expeller pressed extra virgin olive oil during the fall, winter and spring, and organic, expeller pressed grapeseed oil during the summer. After doing this cleansing technique for about two years, I now clean my face daily with just warm water and a washcloth. I do the oil cleansing about once a week. I moisturize with the oil-water combo every day. My skin looks great. Experiment until you find the right regimen for yourself. Cost: $6 for bottle of oil that lasts 6 months = $1/month! I used to love Curel Sensitive Skin lotion but they recently changed the formula and I didn’t want to put more chemicals on my body. It worked great so why change it? I even called the company and told them so. Alas, it didn’t change their minds. So, on my search for another no-fragrance, low amount of ingredient lotion, I noticed that Jergens Sensitive Skin Relief had the EXACT same ingredients as my old Curel. Turns out they are all the same company. Huzzah! I have yet to find a fragrance-free, low ingredient lotion that is as cheap and effective as JSSR. Cost: Approx. $7 for 16 oz. bottle that lasts for 1 month. I’ve tried all kinds of soaps and I still like Kiss My Face’s Pure Olive Oil Soap the best. It’s fragrance-free and only has 3 ingredients: olive oil, water and sodium chloride (aka. salt). I have figured out through reading up on bathing that you don’t have to lather your body every day. In fact, doing this (when you’re not covered in dirt) can result in much drier skin. Most days, your body is fine with just a water rinse and a scrub with a wet towel. Once I realized this, I used less soap and my skin became less dry. And I saved money! Cost: Approx. $4 for 8 oz. bar that lasts 2 months = $2/month! I have read a lot about using a baking soda and water slurry for washing your hair and following it with a cider vinegar and water rinse. I tried it for almost two weeks, but it just didn’t work for me. The baking soda slurry cleaned well but it left my scalp and hair feeling very dry. The vinegar conditioner left my hair shiny (which is good) but still left my scalp feeling dry (not good) and my forehead area pinkish and sensitive (really not good). I decided to try a different technique that I also read about online. Washing with water. Yes, you heard that right. Wash your hair with water as if you are shampooing it. If you need to condition it because you have dry or frizzy hair, then do so. But you don’t need to shampoo every day. In fact, shampooing every day can dry out your hair and scalp which then causes you to condition every day. It’s a vicious cycle. Your scalp has oils that help to keep it conditioned. Washing them away is washing away your natural conditioner. This is my new regimen. Day 1, I wash my hair with shampoo. Day 2, I wash it with water. Day 3, I wash with water. Day 4, I wash with water. Day 5, I wash with shampoo. It took me weeks to find the right regimen that worked with my hair type. We are all different. Experiment. Note that your regiment might change with the seasons. Experiment and find what works for you. Cost: $10 for shampoo that lasts 6 months = $1.67/month! Instead of spending $66/month, I now spend $11.67/month. Instead of $792/year, that’s now $140/year. That’s a savings of $652/year! You don’t have to spend a lot of money to look and feel good. I hope these tips will inspire YOU to find new Super Frug ways to clean, moisturize, look good and still save money. Bubble bath photo by Petr Kratochvil. I just found out from a beauty sales rep that Jergens is discontinuing their fragrance-free sensitive skin lotion. Bummer. I am now on the hunt for another great fragrance-free lotion that moisturizes well and doesn’t cost an arm and a leg. If you know of any, please post and let me know. Thank you. For those of you willing to try using oil as a facial moisturizer as I mentioned above, check out Viva Woman’s 5 tips on how to apply facial oil for optimal results. Thanks, Sesame, for these great tips!